According to the American Diabetes Association, blood sugar levels rise as we age and typically increase by 1 to 2 mg/dl per decade after age 30. Rising blood sugar levels can affect the quality of life and decrease life expectancy. However, there is research that suggests that eating a healthy breakfast at the right time could help in the prevention of blood sugar problems and diabetes. A study in Japan followed almost 5,000 middle aged adults for over a decade and found that those who skipped breakfast were twice as likely to develop Type 2 diabetes. Two recent 2015 studies found that the American lifestyle of eating a light breakfast such as toast and coffee with a large dinner at night was detrimental to controlling blood sugar. It was discovered that eating more calories at breakfast, when the glucose response to food is lowest and consuming fewer calories at dinner, when the glucose peaks after meals, resulted in more stable blood sugar levels throughout the day. In other words, it is better to eat a larger meal in the morning when your body is better able to process those calories. A highly controlled study at Brigham and Women’s Hospital Division of Sleep explored the timing of meals and its effects on the glucose levels. Initially participants ate breakfast at 8:00 a.m. and the last meal at 8:00 p.m. and slept normally through the night. Their blood sugar levels were normal. Then they flipped the timing of the meals. Subjects had breakfast at 8:00 p.m., dinner at 8:00 a.m., and slept during the day. The glucose levels were 17 percent higher in the evening. The finding suggests that the circadian system (physical, mental, and behavioral changes that follow a 24 hour cycle and respond to light and darkness) strongly affects glucose tolerance and that the timing of both meals and sleep were of significance. I was formally one of the toast and coffee Americans. Despite what studies say or find, I have discovered the benefits of eating a good breakfast. Properly fueling my body in the morning provides more energy for my workouts, and I am better prepared to tackle the day. In addition, I have found I am less likely to binge on other unhealthy foods throughout the day. I begin every morning with an omelette, oatmeal, and strawberries. 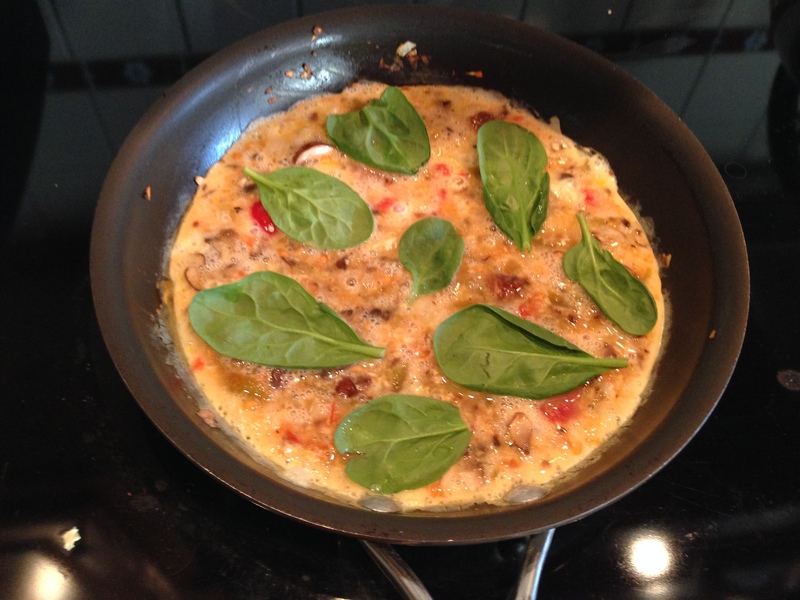 Try this simple omelette recipe. Easy to make and fresh ingredients. Spray a small skillet with olive oil spray and turn to medium heat. In a bowl whisk together whole egg and egg whites. Pour into the skillet and heat for 2 minutes. Top with garlic powder, jalapeño, and pico or tomatoes. Add spinach leaves. Continue cooking until egg sets and begins to brown. Fold omelette in half and serve. This entry was posted in Nutrition, Recipes and tagged Recipes Nutrition by carolcovino. Bookmark the permalink.